The Axiom Pro Basket brings inescapable visibility to the design and quality known from the MVP Black Hole® Pro! 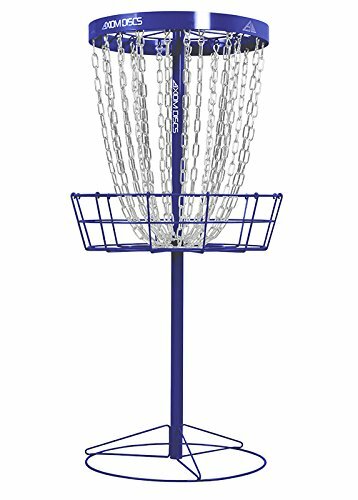 The Axiom Pro Basket comes in six vibrant colors: Royal Blue, Yellow, Red, Orange, Light Blue, and Lime. The tough powder-coated coloring covers the basket head to toe, everything but the chains. Specs are identical to the MVP Black Hole® Pro: two chain tiers comprising 24 strands of heavy course-weighted chain, equidistant strand placement for maximum catching ability, and threaded tension connections for rapid and sturdy assembly. The Axiom Pro is a brightly colored version of disc golf's most popular home basket, the Black Hole® Pro, so bring one home today!